The new Pardelas M and Pardelas L designs enjoy super comfortable padding, a detachable pillow and a padded frame cover to extend comfort. 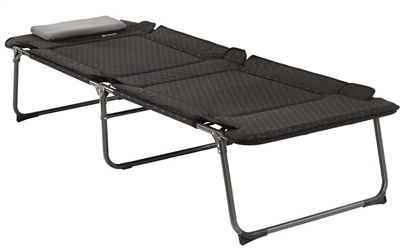 Both have a hook and loop strap to keep the bed folded for transport and storage. All Posadas Foldaway Beds – Single, Double and XL – now have an elastic band to secure a mattress in position. Taller people rejoice! At last there’s an extra long sunbed that lets you relax, snooze and sunbathe without your feet hanging off the end. At over 6ft 8 inches long, the Outwell Pardelas L provides cosy, padded comfort for all. The detachable soft mesh cushions help keep you cool in the heat, while the high strength frame supports you evenly across the bed. Simply unfold to use. New models, new designs and new colours feature in the 2019 Outwell Furniture Collection of stylish, superbly engineered solutions for discerning campers seeking the very best in outdoor products. Inspired by Scandinavian design heritage and the wide-open spaces that surround us,sweeping innovation, versatility and attention to detail deliver smart designs with comfort, reliability and convenience as core values for home from home comfort. These ranges are not just for camping. Their smart lines and flexible use will ensure they’re not tucked away at home but used on the decking, patios and in the garden on an everyday basis.